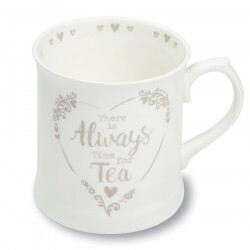 A cute white mug in the shape of a tankard! It's time for tea time! A traditional mug in the shape of a tankard. Farandole of hearts on the inside of the cup and the text "there is always time for tea" on the outside. An elegant and vintage collection with light grey and ecru colours. The british chic is present on a large range of kitchen accessories.